Please check out the link I've installed to the right: "Kanou Baby Countdown". 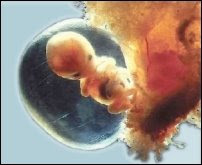 It goes to the parenthood.com site and shows the weekly development from embryo to fetus to baby, and tells what's happening each week. It's pretty neato. And thank the FSM, I haven't had any morning sickness.....yet.